Custom Cryogenic Products | Meyer Tool & Manufacturing - Meyer Tool & Mfg. ​"Cryogenic Products" can refer to a wide variety of different hardware components that are designed to operate at very low temperatures. 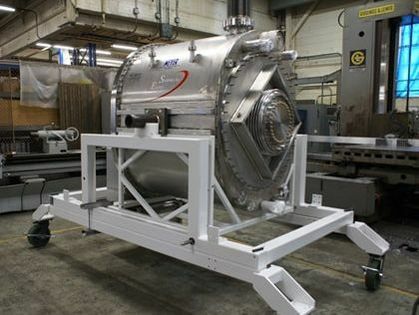 Meyer Tool has been designing and fabricating cryogenic equipment for the particle accelerator industry and other advanced research applications since 1969. Our engineering and production staff is capable of designing and fabricating a wide array of custom cryogenic related products. 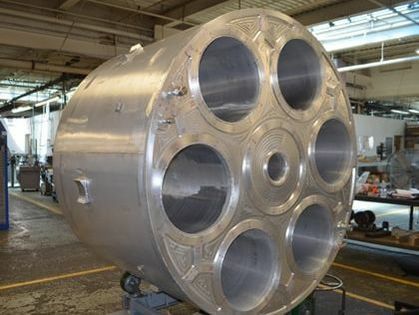 In most cases a cryogenic system will incorporate a mix of products that would include an outer vacuum shell, thermal shields, MLI insulation, internal pressure vessels, and internal piping spools. The exact size, shape, and construction can vary depending on the application. We will work with you to design a custom solution to meet your performance requirements or optimize your existing design for fabrication and build it to your prints. A distribution box, or cold box, is a vessel that is used to disperse or process a cryogenic fluid. We have extensive experience designing and building large cryogenic distribution systems for some of the top research facilities around the world. The distribution box fabrication process utilizes pretty much every one of the Meyer Tool core competencies. Most of the cold boxes we have fabricated over the years require considerable engineering input in order to obtain a design that not only meets performance specifications but also is easily fabricated. The production process involves considerable amounts of welding, machining, and testing time as various piping spools are formed, vessels are machined, insulation is installed, and all internal and external components are welded together. We can design a distribution system to meet your specific needs or we can build a system directly off of your existing prints. MLI or Multi- Layer Insulation is a special thermal insulating system designed specifically for low temperature vacuum applications. MLI consists of alternating layers of double Aluminized Mylar and spun-bound Polyester fabric. 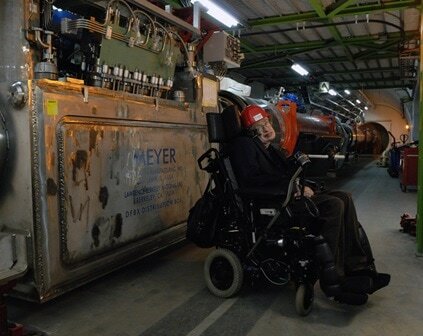 There is no air for convection to take place inside a vacuum. Conduction and Radiation are the remaining forms of heat transfer that need to be mitigated on cryogenic systems designed for vacuum service. 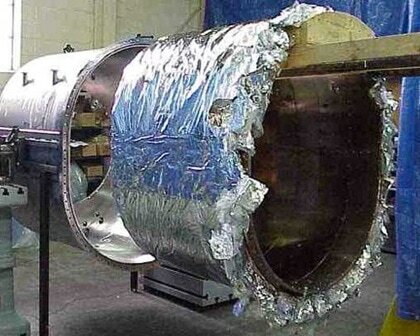 The double Aluminized Mylar inhibits heat transfer via radiation. The spun-bound polyester fabric inhibits conduction heat transfer. The number of insulating layers will depend on the specific design requirements of the vessel. There are very specific handling and installation requirements that go along with the use of MLI insulation. 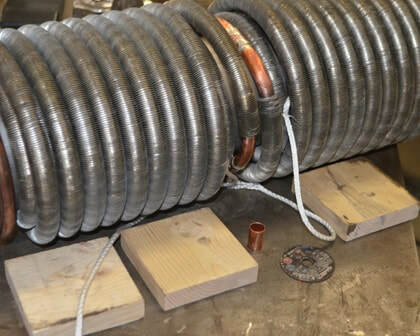 Improper installation can lead to thermal leaks that can undermine the performance of the overall system. Dewars or Cryostats is a type of vacuum chamber that is used to store a cryogenic fluid such as liquid Nitrogen or Helium. The chamber can be designed to include additional MLI vacuum insulation or thermal shields in order to optimize the thermal efficiency of the system. A high vacuum is maintained within the system to minimize heat transfer. We are experienced with the design and fabrication of many different types of cryostats chambers that have been put to use across a wide array of industrial and research applications. Our engineering staff can design a system to meet your performance requirements or we can fabricate a chamber to your existing design plans. We have extensive experience designing and fabricating custom heat exchanger solutions. 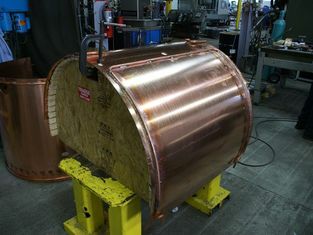 Our machinists are skilled at adapting to various heat transfer related materials like copper and Aluminum. Our welding department staff has fabricated numerous jacketed chambers and custom finned-tubed heat exchanger assemblies. We can build a heat transfer solution based on your design requirements or we can build a solution to your exact prints. Whether it is a one of a kind prototype or production quantities, Meyer Tool has the experience and attention to detail required to deliver high quality parts at a competitive price. Thermal shields or shrouds are utilized within cryogenic systems to absorb unwanted heat within a cryogenic system. The shield is usually composed of either Aluminum or Copper due to the materials high thermal conductivity properties. Tubing is brazed along the surface of the shields in order to cool them down to Liquid Nitrogen or in some cases liquid Helium temperatures. The thermal shields are custom fit in order to wrap around the interior surface of a cryogenic vessel. The shields act as a first stage cooling system that will allow the center of the chamber to reach the lowest temperature possible. Occasionally, additional magnetic shielding, (Mu Metal), is added to the shield in applications where sensitivity to magnetic fields is of a concern.